Finding the right Metal Sander and Deburring Machine for your metal working factory is an investment not just in the books but an investment on the quality of product your factory produces. 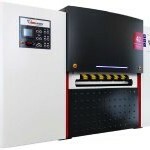 Timesavers has over 60 years of experience in metal working machinery refinement. Our Metal Sanders and Deburring Machines are built with the craft in mind. We know different jobs require different approaches, and nobody offers a wider variety of standard solutions than Timesavers. To satisfy your needs it is important that you find the right machine, including the number of heads, type of heads, wet vs. dry, abrasives, etc. We offer it all and are ready to help you make your decision. Check out the applications below, and if you have any questions please feel free to contact us. Widebelt machines can be built to produce a variety of finishes. The most common finish is a straight-line or grain finish for decorative purposes. These can be accomplished using abrasive belts or in some cases the desired result may require both abrasive belt and brush heads. Other purposes for finishing include preparing surfaces for paint adhesion and achieving a specific micro-inch finish. In other instances the desired finish may be a random, circular or orbital scratch pattern. Timesavers offers machines for each of the above requirements and will run samples to demonstrate results on your product. Deburring with an abrasive belt removes vertical burrs but sometimes results in lateral burrs or sharp edges. Timesavers offers a variety of approaches to remove lateral burrs and soften edges, including soft drums, oscillating brushes, rotary discs and rotary brushes. In particular a rotary brush machine attacks lateral burrs from every angle which makes a radius on all edges and virtually eliminates lateral burrs. Timesavers will run samples to demonstrate results on your product. MODEL 1100 Timesavers Model 1100 machine have a 9” wide conveyor belt, and have been an industry standard for over forty years. Thousands of this simple and economical model are being used to deburr and finish small parts. A small footprint and a minimum power requirement allows this model to easily be placed where the need is greatest. Simple operation and controls require only minutes of training for an operator to effectively produce finished parts. 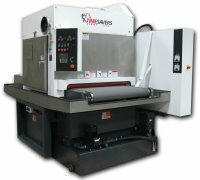 Timesavers dry and wet Model 1200, 9″ wide machines have been an industry standard for over forty years. Thousands of this simple and economical model are being used to deburr and finish small parts. A small footprint and a minimum power requirement allows this model to easily be placed where the need is greatest. Simple operation and controls require only minutes of training for an operator to effectively produce finished parts. 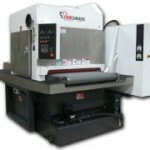 MODEL 1200 – 25″ & 37″ Timesavers offers Model 1200 dry machines in single-belt 25″ and 37″ widths. Simple operation and controls require only minutes of training for an operator to effectively produce finished parts. MODEL 2100 Timesavers Model 2100 is available with one belt in 25″ and 37″ widths. This machine offers many features of larger single-head wet machines, but with light horsepower and compact design for an economical price for lower production requirements. MODEL 2200 Timesavers Model 2200 dry is available in 37″ and 52″ widths with up to three sanding belts or combination of belt and brush heads. MODEL 2200 ROTARY BRUSH Equipped with eight (8), 12″ long, counter-rotating brushes, the Model 2200 is the ULTIMATE DEBURRING MACHINE. MODEL LYNX 19MWT is a 19″ wide machine that can be built with up to four sanding belts or combination of belts and brush heads. This machine is equipped with high sanding belt horsepower and it is the ideal machine to grind and finish rectangle tube or flat bar stock. This powerful machine can perform many functions, including providing a fine finish and preparing material for buffing or chrome plating. 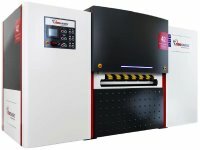 Model 4200 TOP/BOTTOM machine is capable of performing a wide range of deburring and edge radiusing on both sides of the part in one single pass through the machine. MODEL PUMA 52MWT Timesavers PUMA is built in 37″ and 52″ widths with up to four sanding belts or combination of belts and brush heads. The PUMA is ruggedly designed for 24/7 operation. MODEL 2200 SLAG GRINDER The Timesavers Model 2200 Slag Grinder is built specifically for removing heavy burrs (dross/slag) from parts cut by torch or plasma methods.